The Shrine dedicated to the Virgin of Pompeii at Raja Rampur, on the outskirts of Dinajpur, in Bangladesh, is a place of dialogue between religions, “lived in a special way,” reported the Italian edition of L’Osservatore Romano on Thursday, November 30, 2017, the day Pope Francis arrived in Bangladesh for his Apostolic Visit until December 2. Built in November 1999 by Father Cesare Pesce, missionary of the Pontifical Institute for Foreign Missions (PIME), the church receives more than 5,000 pilgrims every week, “persons of all cultures and formation, of all political and religious beliefs,” said Father Pesce, the Shrine’s Guardian. “The devotion of Bangladeshis, Catholics, and Muslims, for the Virgin Mary has increased over time, and I am sure that, little by little, we will be able to promote meetings, collaborations, <and> dialogue initiatives. The Virgin Mary can smooth the difficulties and obstacles put by men,” continued the priest. Father Pesce has made the Shrine “a small Switzerland in Bangladesh,” as his colleagues say. It has a great pukur (“artificial lake’) at the entrance surrounded by thick trees; night lighting that puts in relief the church’s architecture; bas-reliefs n the outer wall that illustrate the mysteries of the Rosary; a Way of the Cross; straight pathways <and> meeting rooms. 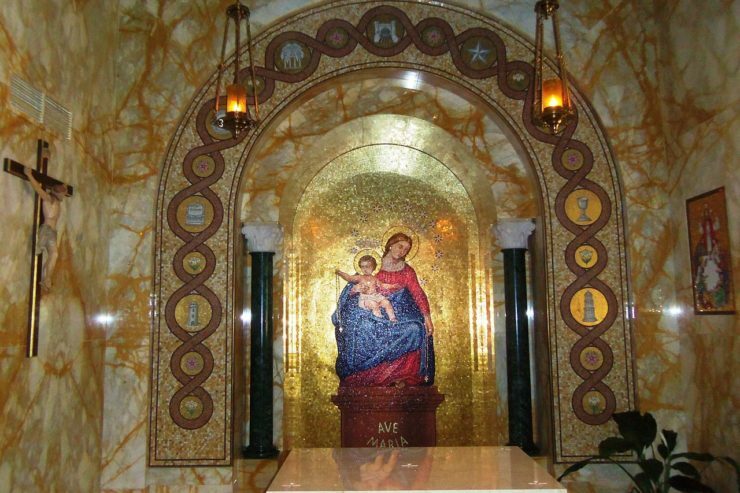 This Shrine was intensely desired by the local Bishop as a “spiritual oasis for pilgrims seeking consolation and peace in the most difficult moments of their life, and to be grateful for the graces received,” he explained. People who come here have “a biography in their heart made up of joy and hidden sorrows, products of love and of unspeakable hatreds.” To be with these persons is a unique experience for me. I thank the Lord,” said the Shrine’s Guardian. Catholics in Bangladesh are only 0.2% of the population. Today their number has increased. Compared to the four dioceses that the Church had, which was visited by John Paul II in 1986, that of today has eight and a greater number of baptized persons and priests, Religious, and local Bishops, as well as a Cardinal, the Archbishop of Dhaka Patrick D’Rozario. Bangladesh is the fourth country in the world with the greatest number of Muslim faithful (130 million).